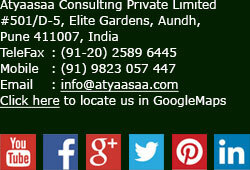 Atyaasaa looks forward to hiring individuals at various positions depending upon the vacancies on contractual basis. This option has been introduced to provide great alternative career opportunities to young and seasoned professionals to experience the learning culture at Atyaasaa. We provide a unique opportunity that gives scope to grow professionally and personally. - Graduate degree in any discipline viz. B.A, B.Com, B.Sc, B.B.A, or equivalent. - The list is indicative and not exhaustive. - PGDM, PGPBM or equivalent. The list is indicative and not exhaustive.